The Company of Biologists Limited (‘The Company’, ‘we’, ‘us’ or ‘our’) is committed to respecting your privacy and your rights under data protection laws including the General Data Protection Regulation (GDPR). This policy (together with our Terms and Conditions, Cookies Policy, Subscriber Licences, any other terms that we agree with you and any other documents referred to in those terms and policies) sets out the basis upon which we may hold and use your personal data. This policy applies to all personal data that you provide to us and that we collect about you (including any personal data that we receive from third parties). Please click here to watch our video on data protection. Individuals who interact with us in other ways and whose personal data we hold and use in connection with those interactions. We collect personal information so that we can operate effectively and provide you with the best possible service. The information we collect depends on the context of your interactions with us and how you use our products and services. It also depends on the choices you make, for example your marketing preferences and other privacy settings. You may choose not to provide certain information but if you do, and that information is necessary in order to provide a particular website feature or in order for us to provide you with certain services, then that feature may not function properly and we may be unable to provide you with those services. Please click on the section below that applies to you in order to understand what information we collect about you, how we intend to use it and our legal basis for doing so. Browsing and viewing publicly accessible areas of the website does not require you to submit personal information to us. However, in order to have access to a user account or to access certain features, services, and parts of the website, you may be required to submit certain personal information that relates to and identifies you (e.g. your name, postal address, email/social media address, telephone number, job title, qualifications, areas of scientific interest, and any personal data contained in log-in/user account details and contained in any submissions/postings you make to the website and in any further correspondence with us). We may collect aggregated website analytics/usage information and provide that information to third parties, but this will not include your personal data. In addition to any information that you provide, we may collect cookies and website analytics information about visits to our website. Please see our Cookies Policy forfurther details. We collect this information in order to enhance your website experience, identify you when you re-visit the website and to improve the performance and impact of our websites and (subject to any necessary consents) to market our products and services.  Our lawful basis for holding and using this personal data is the legitimate interests of The Company as a not-for-profit publishing organisation dedicated to supporting and inspiring the biological community. Where an Author, Reviewer, Website User or other correspondent expresses an opinion about another identifiable person, that information may constitute the personal data of that other person. The Company reserves the right (at its discretion) to delete or anonymise such personal data, but may be obliged to amend, delete or provide a copy of such personal data to that other person in response to a data subject request (see Section 6 below). We may combine the information that you provide or that we collect in relation to any of the above activities with other information in order to enable us to provide a more streamlined service to you. We may undertake other monitoring and we may, as necessary, undertake any data processing that is necessary in order to comply with our legal obligations and to assist any relevant legal and regulatory authorities. This may include the retention and provision to the relevant authorities of CCTV footage and other personal data in our possession. We will only use your personal information for the purposes for which we collected it, unless we may legitimately use it for a related reason which is compatible with the original purpose. We may disclose your personal data in the manner and to the recipients described above. We may share your personal information with your consent or as necessary with selected third party service providers that support us in the performance of our activities, including those set out above, or where we have another legitimate interest in doing so that is not overridden by your interests and fundamental rights. For example, to investigate a complaint, to protect our customers or to operate and maintain the security of our computer systems. We require all our third party service providers to take appropriate security measures to protect your personal information in line with our policies. We do not allow our third party service providers to use your personal information for their own purposes and only permit them to process your personal information for specified purposes in accordance with our instructions. If we transfer your personal data outside the EEA, we will take all steps reasonably necessary in order to ensure that your personal information receives an adequate level of protection and is treated in a way consistent with EU and UK laws on data protection. We will only retain your personal information for as long as is necessary to fulfil the purposes we collected it for, including for the purposes of satisfying any legal, accounting or reporting obligations. For example, we may need to retain some of your personal information for legal reasons, for a period of 7 years after you have made a purchase from us. Longer retention periods may apply to archives of published scientific papers or in relation to intellectual property rights where a transfer or permission could continue to be valid for many years. We may also store your personal information for as long as necessary to complete any purchase or transaction enquiry with you. Where a transaction is aborted, we will normally store relevant information for at least one year following the last recorded interaction between the parties involved (unless a longer retention period applies in line with our document retention practices). In some circumstances we may anonymise your personal information so that it can no longer be associated with you, in which case we may use such information without further obligation to you. The transmission of information via the internet is not completely secure. Although we will do our best to protect your personal information, we cannot guarantee the security of the information transmitted to our site and you acknowledge that any transmission is at your own risk. Once we have received your information, we will use strict procedures and security features to try to prevent unauthorised access or inadvertent disclosure. You are responsible for keeping confidential any passwords that you have to access our services. Please do not share your password(s) with anyone else. If you lose control of your password you may lose control over your personal information. If your password has been compromised for any reason please let us know immediately by contacting us at: dataprotection@biologists.com. Subject to certain conditions, you have the right under data protection laws to access personal data held about you, to object to its processing and/or to request its rectification, deletion or transfer to another data controller. Please see our Data Subject Rights Policy for details of how to exercise these rights. In the limited circumstances where you may have provided your consent to the collection and use of your personal data for a specific purpose, you have the right to withdraw your consent for that specific processing at any time. To withdraw your consent, please contact dataprotection@biologists.com. Once we have received notification that you have withdrawn your consent, we will no longer process your information for the purpose(s) you originally agreed to, unless we have another legitimate basis for doing so in law. This does not apply to withdrawing your consent to receive marketing communications which may be done without restriction at any time (see Section 8 below). You may modify your data preferences by emailing dataprotection@biologists.com or get further information by writing to the Data Protection Officer, The Company of Biologists, Bidder Building, Station Road, Histon, Cambridge, CB24 9LF, UK. We wish to continue informing you of our latest scientific news and research and we will do our best to make sure that our contact with you is relevant. If you have an online subscriber user account with us, then please use it to update your contact details. 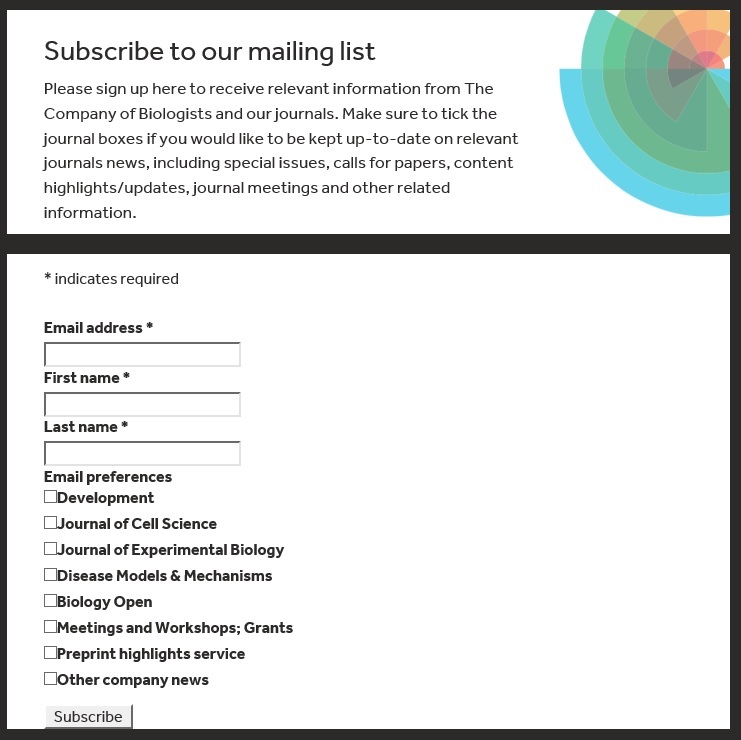 Otherwise, please let us know of any changes to your contact details by emailing dataprotection@biologists.com. Provided that you have given us your prior permission, we would like to let you know by mail or email about our products or services. Should you wish to withdraw your consent to receive marketing communications, you may do so at any time by contacting us at dataprotection@biologists.com, or by clicking on the ‘unsubscribe link’ in any emails that you receive from us. We maintain a suppression list in accordance with applicable laws in order to ensure that unsubscribed contacts are not sent further marketing communications. The Company of Biologists Limited (company number 00514735) is the data controller in respect of your personal data. Our registered office is at Bidder Building, Station Road, Histon, Cambridge, CB24 9LF, United Kingdom. We are registered with the Information Commissioner’s Office under registration number Z5687555. If for any reason you are not happy with the way that we have handled your concern, you have the right to make a make a complaint to the Information Commissioner’s Office.